In a galaxy far, far away… well, not that far away. Here it is! Liquid Glam Lacquer’s In My Own Galaxy is a beautiful deep-space black jelly polish with these bold holographic glitter bits. I can’t help but lose myself in these beautiful nails. It’s a whole new world (or should I say galaxy) out there! For starters, do you realize how hard it is to find a good black jelly that applies very well especially with glitters in it?! In case if you were wondering, the answer is: very difficult. With the Oscars coming up this Sunday, I couldn’t imagine picking a better polish than Liquid Glam Lacquer’s Hollywood. 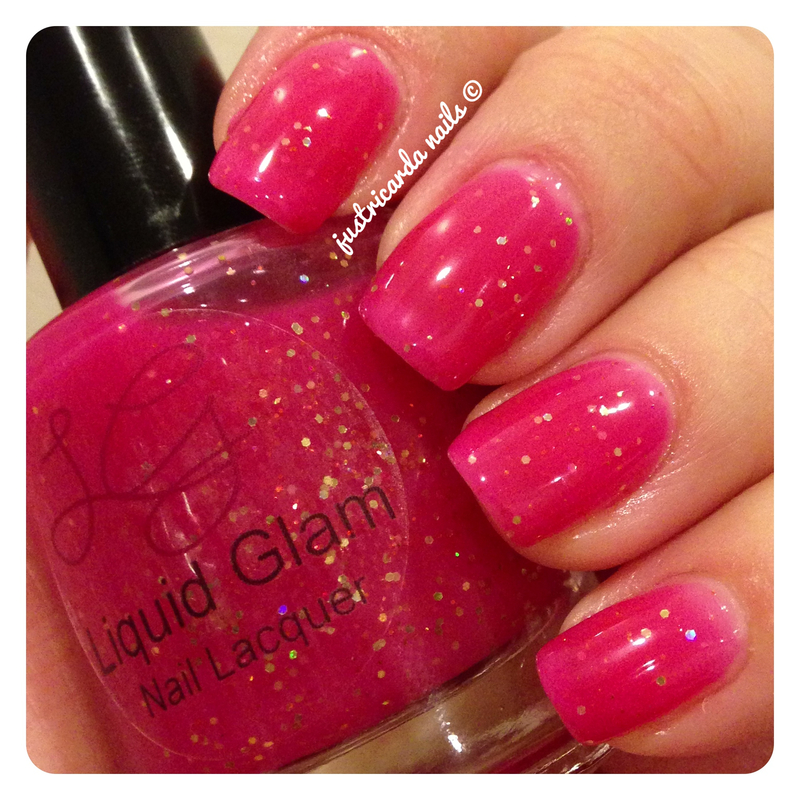 Hollywood is a bright fuchsia pink jelly with these little amazing copper and gold holo bits. I feel like I’m Barbie and I have arrived in Hollywood! As shown in these pictures, this is 3 thin coats of Hollywood with no undies. Application was impressive. I had no problem with glitter whatsoever. It is recommended to wait for a coat to try before adding another thin coat on top to achieve this kind of look. Here’s a close-up for you to see! Liquid Glam Lacquers sent some polishes for review recently. I was in awe by the stunning Girl Next Door. Girl Next Door is a cement grey jelly with all these little holographic sparklers. 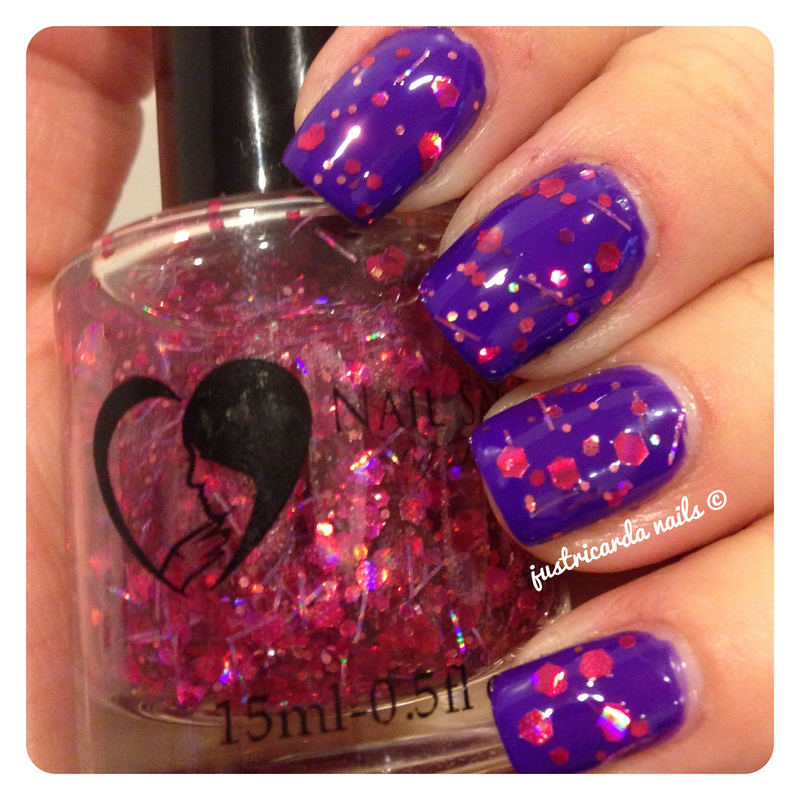 Nail Sauce’s Flashes of Passion is a glitter topper from the Valentina collection. Valentina is proving to be a great collection! Flashes of Passion has hot pink holographic glitter in all sizes and there is also some pink-purple holographic bar glitter. I wanted to refrain from using this glitter topper on top of some pink. I wanted to have it stand out. So I asked myself: what color do I have the most passion for? My answer: purple. Without hesitation, I decided to pair it up with purple. As shown in the picture above, I used one coat of Nail Sauce’s Flashes of Passion on top of two coats of Funky Finger’s Riot. I think this is a great combination of colors! Here’s another view. I went to Five Below earlier today with my children. I had promised them they could each pick out one item from the store. I couldn’t help but look at the nail polishes at Five Below. I *LOVE* the Funky Fingers polishes they carry. It’s very awesome considering how cheap they are! They’re $2 each or 3 for $5 at Five Below! I have several of them at home (Mermaid Lagoon is one of my favorites!). I have had a positive experience with Funky Fingers’ glitter polishes. So I’m there, looking through the bins and I spied a purple one! I love all things purple. Needless to say, I couldn’t wait to swatch this one. This is Funky Fingers’ Riot. This shade of purple lies somewhere between a blurple to a deep dark neon type of purple. Riot is such a lovely shade in person. Picture shown is two coats without any type of top coat. It dries to a flat finish. Its finish looks kind of rubbery or wax-like. I love it!! It reminds me so much of China Glaze’s Creative Fantasy from the Cirque du Soleil collection. However this is a darker purple than the Creative Fantasy one. Here’s some close-ups. Diamonds & Gold is from Nail Sauce’s Valentina collection. I must admit that when I first got the Valentina collection to review, Diamonds & Gold was my least favorite from this collection. However, after putting this on my nails, it is NOW my favorite from this collection. This one took me by surprise! 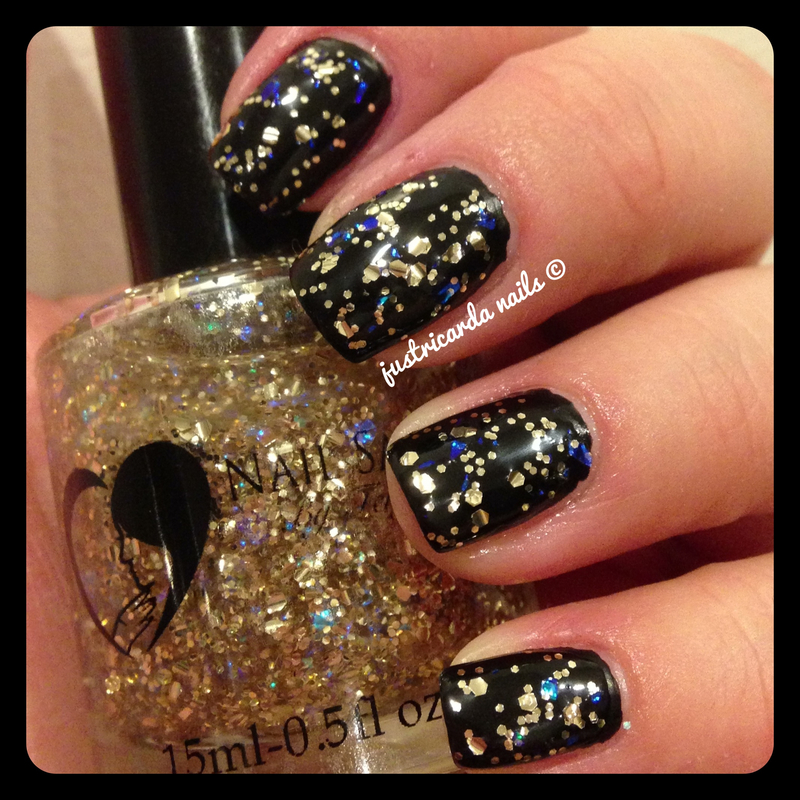 Diamonds & Gold is a gold glitter topper. The gold glitter comes in both small and medium hexes. In addition to the gold glitter, there’s these little amazing blue iridescent flakies. The blue iridescent flakies may not seem much in the bottle but when you put this on top of a dark-colored polish it becomes swoon-worthy. Cult Nails. I have joined the cult when I bought a lot (9 to be exact) last week. I have heard great things about Cult Nails. When they had their sale, I knew it was time for me to buy some. I finally got my order in the mail few days ago. The very first Cult Nails polish I had wanted to try was Fetish. According to the Cult Nails’ website, it describes Fetish as a “wax look finish black polish perfect for the rockstar in all of us.” After trying this on, the description given was perfect for what it is. 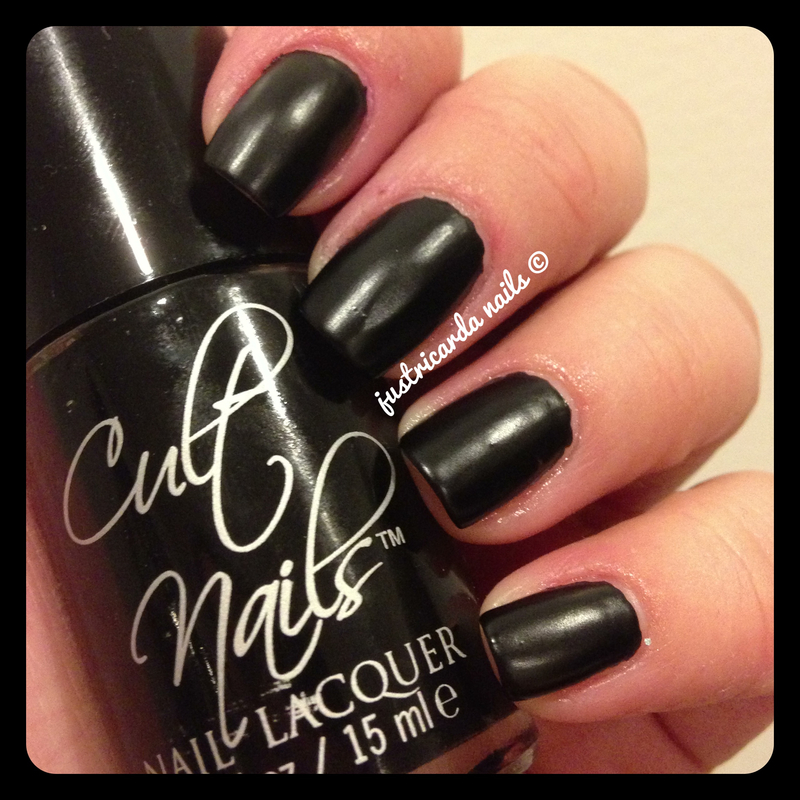 My dear friends, this is hands down my all-time favorite black polish now. Do you know why? Not only because of its “look-at-me-I-am-a-rock-star waxy like finish, but because this is … ready? ONE COAT! That’s right girls (and boys). This is ONE COAT to perfect opacity! You’re probably reading this and going sweet Jesus mother of god; a black polish that’s a one coater?! It’s true. I couldn’t believe how amazing Fetish is and I can’t stop starting at its awesomeness. Here’s a close up.